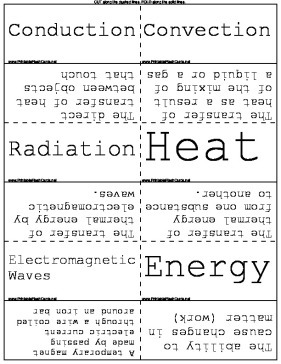 Radiation The transfer of thermal energy by electromagnetic waves. Heat The transfer of thermal energy from one substance to another. Thermal Energy Another form of Kinetic Energy. It is the energy of atoms moving in an object. Nuclear Energy The energy stored in the nucleus, or central part of the atom. Chemical Energy The energy given off during a chemical reaction. Gasoline has chemical energy.